Meeting the Challenge of Ageing: Putting the Citizens at the Heart of Integrated Care in Europe” [download agenda] as a regional event linked to the 15th European Week of Regions and Cities (EWRC 2017). As part of Scotland’s engagement in the European Innovation Partnership on Active and Healthy Ageing (EIP on AHA) and the Reference Sites Collaborative Network (RSCN), Scotland has lead the development of a tool to assess regions’ progress and maturity in the provision of integrated care and innovative solutions for active and healthy ageing. The online self-assessment tool is intended to stimulate discussion, to encourage stakeholders to share experiences, and to reach out those stakeholders who can help Europe to accelerate its journey towards innovative integrated care systems to meet future demands. Core to this process is the involvement of as wide a range of stakeholders as possible. 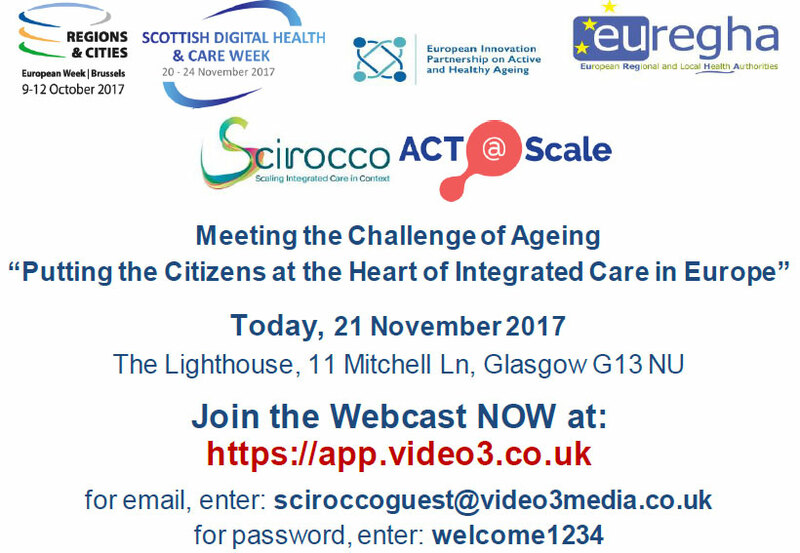 At this event, which will take place in the context of the Scottish Digital Health and Care Week, European Week of Regions and the Committee of the Regions ‘Reflecting on Europe’ initiative, we will bring together public policy-makers, healthcare professionals, representatives of social care, housing and voluntary sectors, academia and end users to discuss the experience of European regions and organisations in developing and delivering integrated health and social care. The event will also be an opportunity to explore the potential of the tool to facilitate the partnerships and knowledge transfer in order to accelerate the journey of European regions towards integrated care.